Churches all across the rural areas of the United States are looking for answers to the declining populations of their churches and their communities. Recently the Church of Christ in Memphis, Texas, found a new, exciting solution to this problem. They realized that there was a large Hispanic community in Memphis and no church to serve them. Sunset teamed up with the local congregation to reach out to the Spanish-speaking community. With a brief campaign with Sunset students, many Bible studies began and three baptisms occurred. The church is now both challenged and encouraged by the new spark of evangelism within their own community. God is working across our nation to win souls and bring life to those who are hurting and to those churches that are dying. Sunset is actively working to help meet those needs where we can and to help breathe life and hope to those that are looking for it. Will you join us as we "Preach the Word" to a lost and dying world around us? Match a Million to Reach the Millions is not about money, but it's about souls. It's about partnering together to utilize the resources at hand to bring about the salvation of those who are lost and have never heard the Gospel. 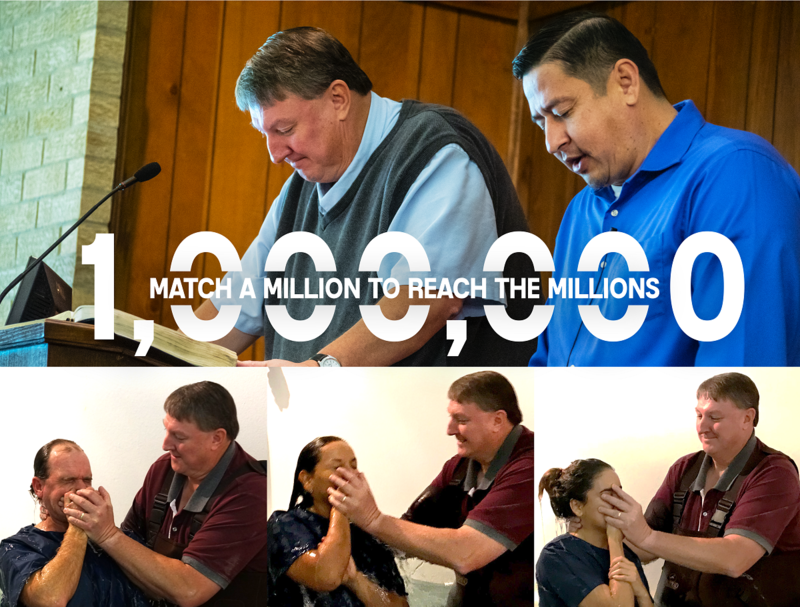 A generous donor has pledged to match up to a million dollars to see that the Gospel spreads. November 27th is known by many organizations as #GivingTuesday. Gifts can be given online at the link below or by contacting our business office at (806) 788-3236. Another way to help is through setting up a fundraiser on Facebook for Sunset International Bible Institute. If you have a Facebook account, you can use visit, https://fb.com/fund/SunsetBible/. We recommend setting up moderate goals like $500 or $1,000, but if you believe your friends will give more, by all means, set up an ambitious goal. Some have already began taking part in this new way of giving. Not only does this help fund the ministry at Sunset, it also allows you to help promote this ministry to your friends. Giving through fundraisers that you setup will be matched by both Facebook and by our Match a Million donor (gifts do not have to be donated only on Monday in order to be matched). Even if you can't contribute financially, you can help us reach our goal. Partner with us as we continue to work in both the United States and around the world, to make sure that everyone has an opportunity to hear the Gospel.